While the House bill didn’t make any changes to depreciation recovery periods, the Senate bill shortens some of them starting in 2018. Nonresidential real and residential rental property would be depreciated over 25 years (vs. 39 or 27.5 years). The bill eliminates various 15-year qualified improvement categories and provides a general 10-year recovery period for qualified improvement property, which would also be eligible for Section 179 expensing. The proposal also requires a real property trade or business electing out of the proposed limitation on interest deductions to use the Alternative Depreciation System (ADS) to depreciate any building structures and improvements. The corporate tax rate would be reduced from 35% to 20% beginning in 2018. The existing seven ordinary individual income tax brackets that currently range from 10% to 39.6% will be consolidated into four brackets ranging from 12% to 39.6%. A portion of net income distributed by a pass-through entity may be treated as “business income” subject to a maximum rate of 25% with the remainder taxed at ordinary individual income tax rates. KBKG Insight: The potential for future tax cuts creates a rate arbitrage opportunity to create permanent tax savings. Consider any opportunities to accelerate deductions such as cost segregation, asset retirement, repair, and 179D deduction studies before tax cuts become effective. Similarly, the corporate tax rate would be reduced to 20% but would be delayed until 2019. For individuals and pass-throughs, the seven tax brackets are kept and range from 10% to 38.5% for 2018. However, certain pass-through owners, except for those that perform specific services, will be able to deduct 17.4% of “domestic qualified business income” in 2018. KBKG Insight: If the Senate bill is enacted, 2017 is a critical tax year for pass-through (non-service) businesses to accelerate tax deductions on real estate holdings as it could lead to increased eligible income for the 17.4% deduction in following years. Consider extending 2017 tax returns to ensure enough time to deploy this time-sensitive strategy. The proposal modifies existing bonus depreciation rules by increasing the rate to 100% starting Sept 27, 2017, through the end of 2022. It also makes bonus depreciation applicable to both new and used property. However, there is an exception to any trade or business not subject to the limitation on interest expense. This includes property used by a regulated public utility company or used in a real property trade or business. KBKG Insight: This may significantly impact cost segregation studies for landlords of residential and commercial property by eliminating the existing benefit of bonus depreciation from newly constructed improvements. All other taxpayers who acquire or build improvements will be able to fully expense various assets quantified in a cost segregation study. The Senate bill is similar to the House bill except that 100% bonus depreciation appears to only be applicable to new property and would also be applicable to property used in a real property trade or business. KBKG Insight: Under the Senate bill, cost segregation studies would continue to result in bonus depreciation benefits for landlords of residential and commercial property. The Section 179 expense limitations for 2018 will increase from $500,000 to $5 million while the phase-out limitation will be increased from $2 million to $20 million. Additionally, qualified energy efficient HVAC & hot water property acquired after November 2, 2017, will be eligible for expensing. KBKG Insight: HVAC and hot water systems that meet this criteria may account for as much as 10% of a building’s purchase price. If enacted, those acquiring, developing, or improving buildings for their active trade or business should consult a Certified Cost Segregation Professional (CCSP) with energy efficiency expertise to quantify how much to expense. The Section 179 expense limitations for 2018 will only double from $500,000 to $1 million while the phase-out limitation will only be increased from $2 million to $2.5 million. Additionally, qualified real property eligible for expensing will be expanded to include improvements to roofs, HVAC, fire protection & alarm systems, and security systems that are placed in service after the property was first placed in service. KBKG Insight: Cost segregation studies for remodels & rehabs will be an ideal strategy for maximizing the Section 179 expense. 1031 exchanges are safe for real property but not for tangible personal property, changing the interaction of Section 1031 and cost segregation studies. 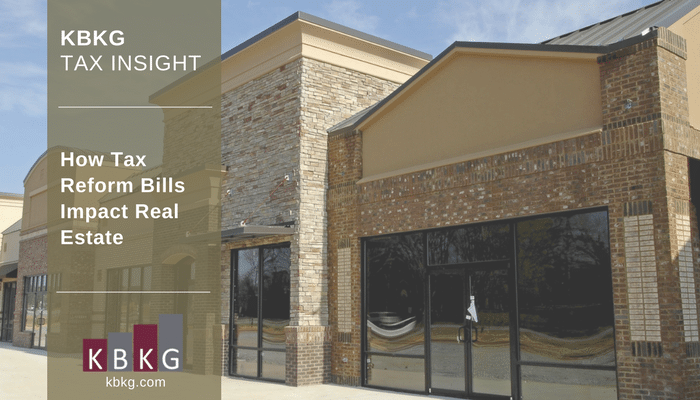 KBKG Insight: KBKG Insight: Cost segregation can still be beneficial on both sides of a real estate exchange but will require careful tax planning. Under the proposed rules, you cannot defer 1245 recapture tax but could offset that with the accelerated first-year deductions from a cost segregation study on the newly purchased property, or any other property in a portfolio. AMT is repealed in 2018. Those with AMT credit carryforwards would claim a refund of half of the remaining credits (to the extent the credits exceed regular tax for the year) in tax years beginning in 2019, 2020, and 2021 with refunds for all remaining credits being claimed in 2022. AMT is also repealed in 2018 except that refunds for AMT credit carryforwards would be accelerated to 2018, 2019, 2020, and 2021 in a similar fashion as proposed in the House bill. KBKG Insight: Taxpayers who have previously been in AMT should consider amending tax returns to maximize their general business tax credits to increase refunds in future years. For instance, multifamily developers in AMT can build up their AMT credit carryforwards by securing 45L tax credits on prior projects where AMT once limited the need for credits. The House GOP and Senate GOP have taken substantial first steps here in putting together legislative text to push forward tax reform with the goal of passing by year end. However, the path forward for tax reform is not an easy one as the GOP makes a unilateral push towards getting tax reform passed and both chambers need to agree on a common bill. By understanding the impact of these proposals, tax preparers along with taxpayers who own real estate can better plan for potential outcomes assuming that tax reform is successful.